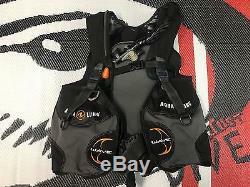 Aqualung Wave BCD -USED- Size XL. This listing is for a USED, EXTRA LARGE, Aqualung Wave BCD. This BCD is USED and in AS IS condition. Some wear and tear is to be expected (see pictures for details). This BCD was part of our pool training line of rental gear, and spent most if not all of its life in an enclosed pool training facility. All BCD have had their annual yearly service, and a pressure test preformed by a certified scuba technician. The Wave is an entry level, wrap-around jacket style BC. It has a legacy of being rugged and fade-resistant but now it offers so much more. You now get a stylish BC that has the clever ability to add an optional weight-integration system! You can dive it in its standard form using a weight belt and then later upgrade it to weight pockets featuring the SureLock II weight system. Made from tough, fade-resistant 1000D Armor shield Cordura. Accepts an optional SureLock II weight system. The SureLock II mechanical weight release system (patented) provides a safe, single-pull release. With SureLock, your weights are secure in the BC. Once engaged, the only way to release the weight is to pull on the handle. A proprietary backpack has a built in carrying handle and a traction pad to reduce tank slippage. The waistband is adjustable in the back to accommodate a wide range of waist sizes. A scooped octo-pocket on the top, front of the right lobe makes it easy to stow and deploy an octopus. The octopus remains visible and accessible throughout the dive. Some divers may find it useful to run their instruments behind the left pocket and out the scooped opening on the top, front of the lobe. Large, easy-to-access, utility pockets are found on either side. Features 2 stainless steel flat D-rings for all of your accessories. Right shoulder pull dump with hi-viz orange pull bob is easy to locate and use. Lower rear dump with hi-viz orange pull bob is useful for horizontal or head down orientation. The chest strap can be adjusted for personal comfort. The exterior is fade resistant and abrasion resistant. Tank band: Universal slotted tank band. Pockets: 2 large utility pockets. Lift Capacity (lbs/N): SM - 29/120, MD - 33/140, LG - 38/160, XL - 44/190. The item "Aqualung Wave BCD -USED- Size XL" is in sale since Saturday, October 7, 2017. This item is in the category "Sporting Goods\Water Sports\SCUBA & Snorkeling\Buoyancy Compensators". The seller is "diversboss" and is located in San Pedro, California. This item can be shipped to United States.